Son Goku has made it to the Tenka'ichi Bud kai, the world's number-one martial arts tournament where the competitors vie for the title of Strongest Under the Heavens. Goku may have strength on his side, but even the training of martial arts master Kame Sen'nin hasn't prepared him for what he's about to face. Only seven finalists remain, each with their own special moves. 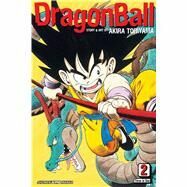 Akira Toriyama's first weekly series, Dr. Slump, has entertained generations of readers in Japan since it was introduced in Shueisha's Weekly Shonen Jump magazine in 1980. A few years later, he created his wildly popular Dragon Ball series, which brought him international success. Toriyama is also known for his character designs for video games, including Dragon Warrior, Chrono Trigger and Tobal No. 1. He lives with his family in Japan.